Champion Trikes conversion for Harley-Davidson Road-King, Road Glide, Street Glide, Electraglide, Electraglide Classic, and Ultra Classic. 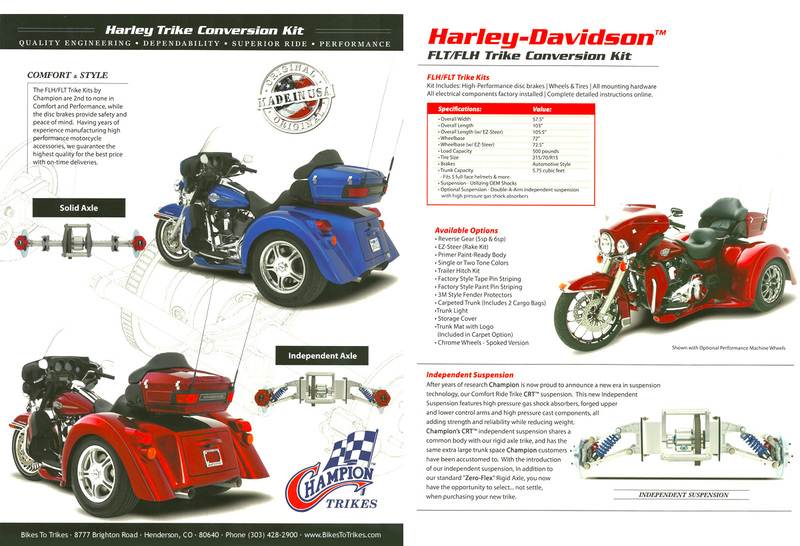 This Champion FLH trike kit features a Comfort Ride Trike (CRT) suspension. The new Independent Suspension features high pressure gas shocks, forged upper and lower control arms and high pressure cast components for added strength and reliability while reducing weight. The standard sway bar can be upgraded to the patent pending Variable Sway Control (VSC) system allowing for increased performance in handling and comfort on the highway. This trike kit is built to the highest standards by craftsmen dedicated to producing a product that will out-perform, out-ride and out-shine all competitors. Available for 1987 and later Harley-Davidson FLH/FLT Models.